Although this challenge is still on-going, I am quite done for this year. I managed to complete 17 paintings since it began, but you see a surprise early arrival had me packing up my bags and flying off to Calgary! My beautiful new grandson Henry was born a few weeks early! And so I said to heck with the challenge and hopped on the first available flight. And I do have a few more on the easel waiting for my return. This is the fifth time that I have participated in a 30 Day Challenge. You can see my previous efforts here. With each challenge I like to have a goal, something to learn - that I work towards. I feel pretty good about what I accomplished with my approach this year. I had decided to only work in oil. It is a medium that I have been exploring for awhile now and think I have come to an understanding how to work with it. At least how I think that I want to work with it. Grisaille how cool a word is that? What I know to be true, at least for me, is that I do like to plan my work and have a grisaille underpainting prior to adding colour. Not all subjects require this step. But for me with the way my mind works, it makes the colour application make more sense. You see I like to work with thin, transparent glazes. Slowly building up the colours before I add in strategically placed thicker juicy paint. Oh, did I just expose the watercolourist in me? This is funny now that I have said it! Old habits die hard. Painting alla prima (in one session) made sense for a few of the paintings - working really well with the mussel shells. 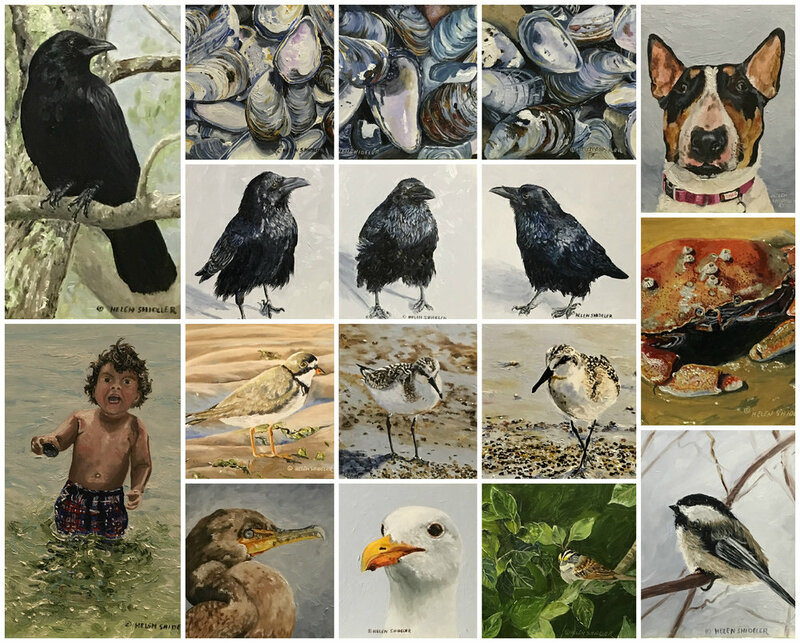 In fairness, I have painted so many mussel shells over the years that I could probably paint them in my sleep - they are a subject that I know so well. Honestly, I would have approached he painting with the sweet little sparrow differently knowing what I think I know now. I think I would have felt better painting this one if I had taken the time to do an underpainting. Because the bird was included as part of the landscape and not painted as a central subject, the background and leaves felt like busy work. I was not as satisfied with the end result as I would like to have been. It works, but I had a different vision of it in mind. You have to get over your, um my... need to go back in and add in more detail. In one sitting means just that. It is so hard to resist. But, in my mind - there really is no rules. Rules are self imposed and made to be modified and ignored when convenient. The other, perhaps the most important thing to remember is that applying many layers of paint over each other, without a few days dry time will create muddy colours. I learned a new use for my pallet knife. Scraping. Yep. I had to remove areas on a few of the painting in order to re-apply the right colour intensity.